Nonprofits have been a cornerstone in American communities for health, education and information since the early 1900’s. Over the past few years, human-I-T and the Do Good Bus have been actively working to improve life for individuals and families throughout Los Angeles, California. The Do Good Bus provides a different approach by empowering volunteers to make a difference in communities and raising awareness about local issues. In California alone, nonprofits employ over “900,000 people - almost 7.5% of the state's workforce and generates almost $295 billion in annual revenues,” according to independentsector.org. Organization such as the Do Good Bus have shown to help communities by focusing on dozens of causes throughout the year. Volunteering is not a new phenomenon. The American Red Cross was one of the first national volunteer organization to help people with emergencies and disaster relief. Clara Barton started the ARC in 1881 after witnessing a similar organization in Europe and was inspired to create a similar organization in the U.S. Nonprofits have been essential to strengthening communities and providing the necessary support for those in need. By expanding their reach to help more people The Do Good Bus uses their time volunteering for multiple causes throughout the year instead of focusing on one cause. I recently talked to Rebecca Reeder, Founder of the Do Good Bus, on why she started this organization and the impact it has on our communities. “I was inspired by a birthday bus that my brother and I hosted, where we surprised everyone that didn’t know where they were going or what they were doing,” Rebecca says. “ I realized very quickly how these people didn’t know one another could connect very quickly on the bus.” Over the past seven years the Do Good Bus has worked with a myriad of organizations such as Foster The People, KIND Snacks, Standford University and Disney. Since 2012, they have been volunteering with human-I-T to bridge the digital divide in low-income communities throughout Los Angeles. Rebecca says she was looking to expand volunteering opportunities by “finding something different that would be good for groups.” That’s when she discovered human-I-T would be a great fit for volunteers from the Do Good Bus. What makes volunteering exciting for them is keeping the event a mystery until they arrive onsite. This inspires their volunteers by “helping the community and by getting to know one another and working together as well,” Rebecca say. 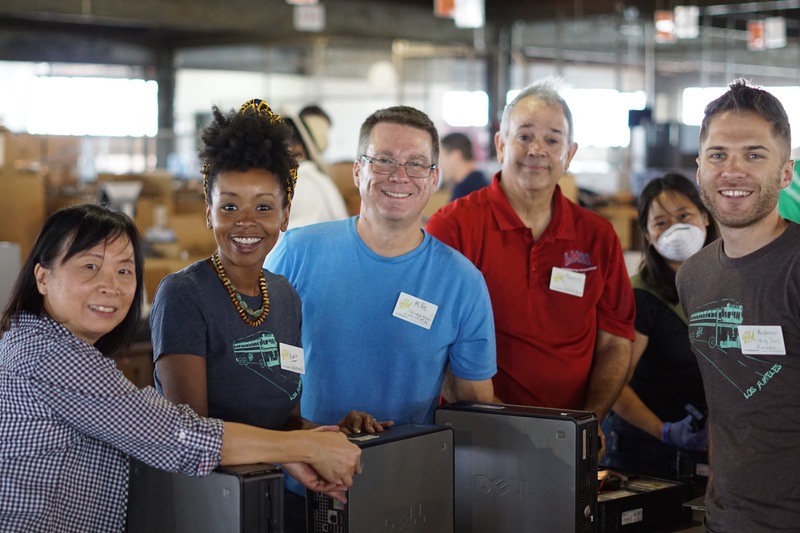 Another key way to inspire people to volunteer is by “connecting them to our community, especially here in LA and connecting with causes that need the help.” Volunteering is an important way to show support in your community and figuring out which cause is best for you can be a difficult decision. Rebecca says that “what we're doing with the bus is introducing them to a cause and we’re giving them a shot to check it out and get inspired.” human-I-T is one of those great causes that the Do Good Bus visits on a regular basis. Collaboration brings teamwork, awareness to different causes and inspires others to get involved with different organizations. How can you make an impact? Click here to learn more about our programs and see how you can help those in need by making a monetary or technology donation.